Slave to the pedal? How to detox your rig and knowing what you have. 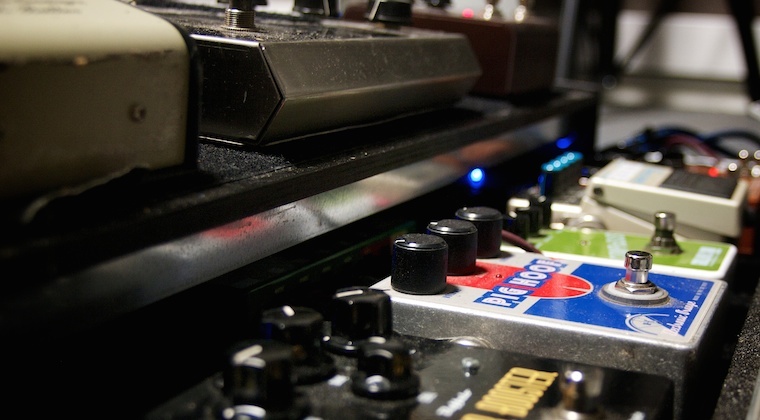 Are you a slave to your pedals and effects? Arenâ€™t we all? Itâ€™s easy to get blinded by all the effects available today. Each pedal seem more irresistible than the other but do we really need them? In this feature weâ€™ll get down to the basics and take a critical look at the GAS weâ€™re all suffering from. Thereâ€™s two reasons why you want to ask yourself that question. One: the more stuff you place between your guitar and amp, the more your tone will suffer from circuits and cables sucking the sweetness out of your signal. You can compensate with buffers, better cables etc but what youâ€™re really doing is adding even more to the equation and not least, spending more money. Two: the more stuff you have, the more guitars, amps and pedals, the more youâ€™ll get distracted from what really matters: becoming a better musician and song writer. Sure, a pedal or guitar can inspire to write new songs but then you actually need them. Theyâ€™re not distracting. So, whatâ€™s the remedy? Studio engineers or producers talk about detoxing their mix or studio. What this means is that every once in a while they go through their hardware and plugins and throw away whatever they havenâ€™t been using for the past year or so. It also means that you should evaluate your mix and ongoing project and delete all the plugins that you donâ€™t really need to make the song better. This detoxing exercise aslo applies to playing guitar. Every once in a while, take a good look at your bedroom rig, your recording setup or stage rig and ask yourself â€œdo I really need all this?â€. Do you really need to have a pedalboard cluttered with every single pedal in your collection? Do you need to have five, eight or twelve guitars? Does it make you a better guitarist? Limiting yourself to the bare minimum of gear that you actually need, can both force you to and inspire to create new sounds and techniques based on the fact that you donâ€™t have all the tools in the world available. This is what guitarists and engineers back in the 50s and 60s did every day. Want distortion? Poke a hole in the speaker or play loud and your tubes will distort. Want flanger? Put your finger on one of the tape reels and you got flanger. One of the best pedals to create limitations with is the classic germanium fuzz. As an exercise, throw away all your dirt pedals and try to get the most out of this fuzz alone. It can boost the clean or dirt channel on your amp. It can produce warm overdrive for rhythms and leads and screaming distortion when you need it. Hendrix was the true fuzz master and he managed to make it sound like at least ten different pedals just by utilizing the potential of the controls on the pedal and guitar. It comes to a point when you probably donâ€™t know or remember what your guitar and amp actually sound like. Weâ€™ve been stacking pedals and expanding the pedalboards yeras and forget about the basics. But I find this very inspiring. Without effects I notice that I play differently. I listen to my playing in a different way and Iâ€™m more focused on whatâ€™s really happening, which goes right back to that studio reference. Without any plugins or effects, itâ€™s just the recorded tracks and if they sound like crap then no plugin (or pedals) will be able to save them. What this all comes down to is knowing your gear. The biggest mistake I see people make is when they plug their brand new guitar straight into the pedalboard. Youâ€™ll never be able to learn and experience how the guitar really sound and how it interacts with your amp. Spend time with your new guitar and experiment. Learn how the different pickups sound and interact with each other. Use the volume control to shape your tone and enhance the dynamic range. Does the neck make you play in a different way than on your other guitar? Is the action off or the string gauge too thin? Any assumptions or neglects will make your purchase completely wasted. Same goes for the amp. Experiments with the controls and, if there are, the different channels. How does the guitar and amp interact? How do the way they sound make you play? Is the guitar right for that amp or vice versa? Do you need to adjust the settings on your amp between your guitars? By now you should have realised that knowing your guitar and amp intimately, you probably donâ€™t need as many pedals as you thought. Compressors, boosters, overdrives and EQs are often used to compensate for something that your amp canâ€™t do or that you thought it couldnâ€™t do. The right amp settings that matches your guitar and perhaps even a change of tubes or speakers, will often eliminate a few pedals or at least the need to use them as much. This means a cleaner signal and less focus on your pedalboard. But I need all those pedals! So what about collecting gear? What about trying to emulate a wide range of your favourite tones? Well, the same principles applies. Youâ€™ll need a nice palette of pedals if youâ€™re trying to simulate David Gilmourâ€™s tones but be tough and only use the pedals that you really need. Focus on your playing and not on the details of Davidâ€™s setup. If youâ€™re a serious collector, then I assume that youâ€™re collecting and not trying to fill yet another pedalboard. Still, thereâ€™s nothing wrong in collecting gear or emulating someone elseâ€™s tone but regardless of whether youâ€™re writing your own music or paying tribute to someone else, you should take your music and playing seriously. Have some though of what youâ€™re doing and what you want to achieve. Donâ€™t have too many distractions in front of you and always ask yourself twice when you want to buy new gear. Do you really need it? Please feel free to use the comments field below and share your experience on the topic! Although deviating slightly from strictly David Gilmour & his rig I have been trying to find details of what set ups the various second guitarists who’ve been through the ranks with David, use. Its the role I have with a Floyd tribute band I’m in. The main guitarist has assembled a great pedal board and has a sound & tone as close to David as you could wish for but we are constantly as odds over the sound I’m getting and tones/ frequency clashing. It’s tricky as sometimes the second guitar parts need to be close to Davids but I’m coming to the conclusion that I should really be looking to see what Phil Manzanera, Tim Renwick , John Carin tend to use to get a sound that is complimentary to the overall sound. Any advice, help, recommendations etc would be appreciated. I use a standard strat through a Laney Cub 12 with a Line 6 HD 500x multi effects unit using the favoured 4 cable method into the amp FX loop. Depends on what parts you are covering. I think, perhaps apart from Carin, all of the ones you mention, including Snowy White who played with Floyd in the 70s, had their own style and tone. They were covering David’s rhythm parts and the occasional solo, but you could hear their style coming through. Being in a tribute band I would imagine that you want to be closer to how David actually did it on the albums and if you listen, a lot of the rhythm parts were done with just a clean tone or some mild overdrive. Nothing fancy and you don’t want your rhythm parts to take up too much space. I think the best way to approach it is to figure out what parts you need to cover and then sit down with your lead guitarist and see what he’s using on the same parts. Try to match it but keep in mind too that if he’s using a Muff, then you probably want to use something with less gain. Try not to use too much mid range oriented pedals but keep it feirly neutral. You want to be heard but not over the leads. Good luck! Hi Bjorn, fantastic post as always. This us something i always think about and also came to these conclusions some time ago. The GAS is the worst thing for distracting from what’s really important, the true passion for being a good musician (and always improving on it). I know from personal experience, the more stuff you have the more distracted you will get and believe it or not the more unhappy you will get, as you will always spend more time gasing for new pedals, forever trying and buying new stuff instead of actually focusing on your playing and music. I’ve actually been able to be more creative in coming up with new stuff just by playing with my guitar unplugged (or with just a small amp) than I ever was with it connected to a full pedalboard. If you think on how Gilmour uses gear you will see that the main focus and tone core as actually always been the guitar and amp, the pedals are there to enhance and sometimes slightly color and add to that. David will sound like him with just the strat and a small amp. That’s where the magic is (starting with his fingers and personally), not on any specific pedal or effect that he can use. One thing that always bothered me when I go to a music store for example, is when I ask to try out a guitar the guys there always crank up an amp and lots of stuff. I never ever plug a guitar into anything when I first try out a guitar. I always play it acousticly, evaluate wow it sounds, rings, and feels for a good while, and then I play it through a good clean amp, nothing else. No pedals, no distortions no nothing. If the fundamental tone and feel is right, than that’s the main thing for me, everything thing else can always be changed. If I got a guitar and immediately played it through a crancked amp, most of this evaluation would be lost. As much as I love gear (and I do) I’ve always instinctively been more focused on my playing evolution and on the music ( chords, chord progression, solos, arrangements…) than on the gear in actual using. As a matter of fact…I haven’t bought a pedal in about 4 years now. Bought a second strat 2 years ago, before that a gap of some 3 years. No new amps. I’ve been playing the same guitars, amp and pedals without changing anything for 5 years or something like that. I think I’ve found “my sound”. Sometimes I try different stuff I have laying around or another guitar…and it just doesn’t sound right. Other times I do indeed unplug the whole rig, play without pedals a little and than add each pedal, looking for flaws in the tone. It just keeps sounding right…even if there is some tonesuck. But you are really spot on about the detoxing. I guess it stays important you know what you’re using and what new things add or remove from your sound. It’s such a huge difference plugging a Les Paul in my setup…it sounds great, but not really usefull in my bands for example. really a great article! I suffered on GAS for the last 15 years in every aspect – guitars, amps, pedals. Now, 66% I have under control (amps, guitars), but pedal-Gas ist still there. What about the Mojo Hand FX Pompeii – do have already tested one and may we expect a review? Thanks! The Pompeii I got for the review was broken and we decided to cancel the review since the pedal was a limited run. Others: don’t you think to create a “gear for sale” microsite here as a closed circuit international marketplace? It should help a lot collecting, finding, changing, chasing effects, guitars and amps between us, do you? This would be so much easier if the local library carried pedals. We probably just want to try something new every week. Another informative article Bjorn, keep em coming :) Reading this article I must say in the process of assembling my board I have become a slave to the pedal. I probally have more pedals then I need and have been tempted numerous times to buy the latest and greatest pedal which is most likly a repackaged version of a pedal I already have. Oh well, I unfortunatly found guitar and this great hobby later in life and am enjoying every minute of it. Few questions for you. 1. I’m getting ready to wire my new board with evidence SIS plugs. The last time I did this, I measured each wire to be close to the exact distance with some space between each pedal if that makes sense. While the end result looked really clean, I noticed it was hard to swap pedals in and out, reconfigure things. With the wires being so short it seemed like it put alot of stress on the jacks when removing the pedals etc. This time I’m thinking of making each wire a certain length with the exception of some of my pedals that will require a slightly longer wire since they are going from a pedal with side jacks to top jacks vice versa. Any recommendation on a general wire length, I’m trying to make the board look clean while having that versatility to interchange a pedal everynow and then. 2. I think I saw somewhere – facebook/this site you were looking for ideas on future youtube videos. I’d like to learn how you do your slow and fast vibrato while bending. I’ve noticed your able to do it without moving the neck, looks like you are getting leverage from your thumb and somehow using your fingers to move the strings up and down smoothly. I can somewhat do this but definitly dont have the movement in my fingers without boucing them on the string which ends up moving the neck. Maybe a video tutorial on this in the future :)? And thanks again for the Laney Cub suggestion. I have the 12R combo amp but had to go through two lemons before I hit the mark. The pilot light is intermittent but it’s the sound I’m concerned about. Just beautiful. FYI: The reisssue of the Electric Mistress is a failure. It doesn’t sound then same and there are a few “defects”. Once the rate is increased you lose the wider range. Ironically he ElecLady is more on target than the official reissue. To add insult to injury the DonnerÂ® Jet Convolution Flanger (a clone of a clone) sells for $30.99 from China with no S+H charges. Pair it off with a DonnerÂ® Boost Killer for $30.99 and you can compensate for the volume drop as well as EQ it to get rid of that brittle sound when using it with distortion. A very economical solution indeed. Oh the irony. On a post about GAS and resisting it, you end up inciting me to spend more money. Donner Boost Killer on its way; at least, it won’t break the bank, but I might have to rethink my coming purchase of a Pedaltrain Metro 20 and upgrade to 24 instead. I do not thank you, Sir. Great point, Bjorn! I like very much this kind articles you did about the approach to the music, to be a musician and not only a gear geek! And…I forgot to tell you that I really like how you’ve rearranged all the website really a nice job! You make an excellent point, Bjorn- How much stuff, how many guitars? As for guitars, only six. Well, that includes my electrics but doesn’t take into account my acoustic or classical. Okay, okay, I’m seeking help for this GAS sickness. But I’m damn near as old as Gilmour and it’s taken a while to get to this point. But, seriously, I’ve approached the thing of buying effects (and guitars) very slowly. Listen a lot, read a lot, talk to a lot of people and think about what kind of music I like to play before deciding I need it. And I really like what you said about getting back to listening to what the instrument sounds like without all that stuff, pretty amazing. Thanks for your great insights! Yes, Bjorn, your’re 100% right! My “personal problem” is to find ONE overdrive/distortion pedal that does not sounds “fuzzy” nor “muffy” (and living in Brazil..)…. And… in combination to my poor Mustang III “digital” amp, humpf! Best regards! Cheers, Carlos! Overdrives are hard to figure out. I’ve always struggled to find those that fit my guitars and amps. One of my favourites at the moment is the Wampler PlexiDrive. It’s incredibly versatile with a vintage Marshall character and a bit of that slightly more modern Tueb Screamer mids boost to it. It’s funny. Whenever I am learning something new. I either play the guitar unplugged or just straight clean into the amp, (not even any reverb). I have always done this so that I could uncover any mistakes and/or sloppiness. I’ve always done that too. Either clean or just unplugged. Nothing is distracting. I’m currently putting a board together for a floyd tribute project and I am trying to be really strict about what pedals I use as it is so easy to have 3-4 muffs/fuzzes , 3-4 delays 2 compressors, Flangers, univibes, choruses etc etc before you know it the rig looks like the cockpit of an Airbus. Obviously you need to copy the great mans setup but I’m going for versatility and good quality to keep the board and cable runs to a minimum. It’s also wise to keep in mind that Pete Cornish has put high quality buffers all along Daves chain to maintain the signal integrity, if you don’t have that sort of gear available though you just have to keep it as clean as you can. Also I’ve noticed Davids setups are much more simple nowadays, ie shine on and comfortably numb at gdansk. Yet he still sounds amazing. Glad to see this post here , especially when we are all such gear whores. You hit the nail on the head with this!! I keep one distortion the evolution and one overdrive set to be light, a volume pedal, tuner, a chorus and delay. With this setup, through my red strat with EMGs and reeves custom 50 with reeves cab and rotary cab, there’s really no genre I can’t fit in with. If I want to try another pedal, say a modulation, I take the chorus off, and use it, instead of having both. Same goes with distortion, overdrive or delay. I just utilize my guitar volume a lot. I am getting, I think, a tube driver soon. If buffalo fx don’t hurry up with their clone ;) I wanna replace the toptone light drive. So the tube driver will soon be in there. Another thing that helps me keep my pedals to a minimum is my power supply. It only takes 8 pedals and I refuse to buy another power supply, so I have to settle! Just thought id share! Love the article.